Your solar power system has been installed. What next? Unless your solar installer is also qualified to work on your meter (usually, they’re not), you’ll have to wait for a separate sparky from your electricity retailer or network to come and reconfigure your meter to measure your exports. They may even need to give you a whole new meter. If it isn’t part of your installation quote, this usually costs about $300. It’ll cost more if you have a three phase supply. You are not normally allowed to switch your solar power system on until your new meter is installed. To help pass the time, you can do some simple checks of the install. I’m not recommending that you climb on the roof or try to do the job of a trained inspector, but there are simple things that can get overlooked. You can easily look for these and quickly get them put right so your system has the best chance possible of lasting 25 years or more. Here are the things to look for. Inverters and isolators are protected from lengthy exposure to direct sunlight. Any outside, wall-mounted isolators do not have any electrical conduit entries from the top. This is a recipe for rain getting into the isolator, and that’s big trouble. The cables going into the solar inverter are neat and secured so they can’t be pulled or caught. All open conduits are sealed with a gland, not silicone. The inverter (or third-party monitoring system) is set to alert you if something goes wrong, so you don’t have to wait for the next bill to find out. If your house is single storey, you should be able to see all this from the ground – don’t go climbing up there unless you know what you’re doing. The solar panels are neatly lined up and level. Anything else is just plain lazy. Any excess rails are trimmed. Any cables between panel arrays are not via an ugly, sun-exposed electrical conduit but through the roof cavity. If your quote and design assumed no shading, your panels should be unshaded throughout the day. Be wary of TV aerials, roof vents and flues. All rooftop isolators should be shielded from the sun. Any tilt-racking legs should usually be at right angles to the solar panels for maximum strength. If they aren’t, check that this is allowed by asking to see the racking manufacturer’s instructions, which will contain the relevant diagram. I’ve noticed that solar installers are excellent at electrics but they can miss a trick on the mechanical side of things, so this is worth checking. 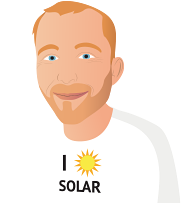 Sadly, many solar installers – even the good ones – don’t give documentation the priority it deserves, so you may have to hassle them for this. If anyone comes to service or inspect your system, or do other electrical work on your house, it’s an important reference for them too. Moreover, the Australian Standard for solar installation says it has to be provided, so insist on a full documentation package.